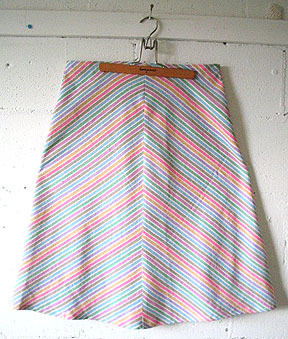 Last night I made a skirt out of that stripey fabric from Value Village that I got a while ago. There is rumor of warmer weather next week, so I want to be prepared. Currently however, we are having a hail shower - second one in a week! Despite what seemed like 20 minutes of scheming and planning to get things right, the stripes on the front are still pointing upward and the stripes on the back are pointing downward! Oh well, good enough. 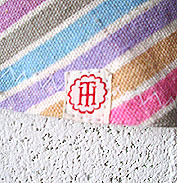 Paul suggested I use this great vintage initial ribbon that Rosa sent way back when I got Hank. It looks cool on the bottom hem. 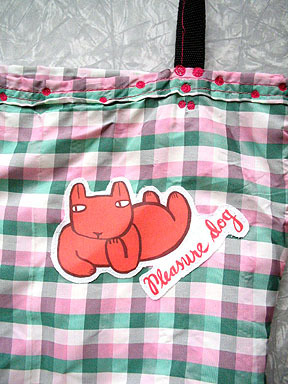 I also put Camilla's sweet patch onto the bag my friend Prisca made me for Christmas. cute skirt! do you have a skirt pattern or did you just make it up? i want to try making a skirt too. "Despite what seemed like 20 minutes of scheming and planning to get things right, the stripes on the front are still pointing upward and the stripes on the back are pointing downward!" I do the same sort of thing all the time. It's really cute. oh what a cute skirt! I have been waiting for fabric from this online company for a month (NIGHTMARE!) but when it comes I want to make skirts too. The last two days have been nice here and I got to wear skirts! Now it looks like rain may be coming but I'm in a skirt so I hope it doesn't get too cold! What a nice site. Thanks for alot of inspiration. well, it was a pattern i had traced off an old a-line skirt i have. very easy - 4 pieces and a zipper. i have 5 skirts in this shape now! i love your skirt- dreamy!! i want one! i am such a klutz with the sewing machine. Fabulous skirt! Congratulations on tackling stripes. The ribbon is such a sweet touch! Tania the skirt is so adorable! I love it, I've come back here a few times today just to look at it again! So cute and springy. perfect skirt! I'm itching to make one, I usually make 3 for the summer and I have fabric waiting to be cut up-skirts are the BEST things to sew in my book. They are so over-priced in shops, and who wants to try and sew pants?? ooh...i *love* that! nice job, tania! i wish i knew how to sew. i refuse to wear shorts in the summer. i'm all about the skirt! that skirt is screaming for a comfy tshirt and a pair of sandals! very lovely!